The rail line between London and Luton has reopened after "major disruption" was caused by damaged overhead wires, a rail company said. Rail passengers were unable to travel between the Bedfordshire town and London St Pancras as the line was shut. East Midlands Trains said specialist equipment was needed to repair the wires at Cricklewood. It told customers if they were already using alternative routes, their tickets would still be accepted. The company advised passengers on how to claim compensation if they were delayed by more than 30 minutes. Earlier, passengers expressed their frustration on Twitter. One passenger said: "We're standing at Luton and no-one is telling us anything? Are we getting to London today?" Matt Yates, who was travelling from Luton to London, said: "There are a lot of frustrated people here. It's cold, there's children and elderly people waiting too." Another passenger took to Twitter to say: "No trains out of St Pancras, no staff to tell us what is happening. My wife is singing in a concert in Leicester and now we can't get there. "Yes, cancellations happen, but no help or staff is shoddy." Image caption Rob Dracup said the replacement bus from Luton was "very full"
Rob Dracup said he got a "very full" bus replacement from Luton to St Albans. But he ended up paying for a taxi at his "own expense" as there were no buses at St Albans, he said. 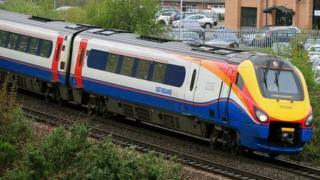 Mr Dracup said East Midlands Trains "may not cause the issue but they have zero capability to manage the consequences". The disruption came as the London Landmarks Half Marathon took place in the capital, with 13,000 runners expected to take part.